In the past 20 years, the Andean crop quinoa has risen in popularity in the global north as an exotic and healthy food. As it has become more common in restaurants and supermarkets in North America and Europe, discourses have emerged ranging from simply how to pronounce it to whether or not its importation is helping or hurting Bolivian farmers. Our encounters with quinoa reflect modern dynamics and disparities in global political economies and health, all of which can be further interrogated when considering the long-term history of this crops’ production and consumption. Through archaeological and historical data, I trace the shifting political and economic role of quinoa: beginning as a core food and staple of indigenous Andean communities, its transformation to a low-status food in the colonial Andean context, and finally its current position as a global “superfood” and renewed status in the Andes as a valuable “traditional” food. While the political status of consuming quinoa has often been dictated by those in power, tracing the history of its sustained cultivation reveals the resilience and persistence of its producers. 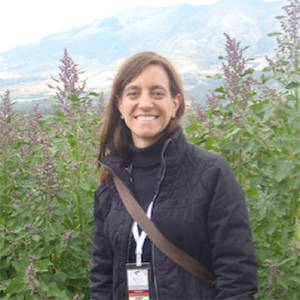 Maria Bruno studies the diversity of practices that smallholder, farming societies, past and present, employ to create productive landscapes, and how these practices shaped and were shaped by interrelated environmental, social, and political processes. She investigates these landscapes through patterns in plants: those that have been domesticated and modified by farmers and the wild plant communities that change in response to human activity. She works primarily in the Lake Titicaca Basin of the South American Andes. Specific topics of investigation include: the domestication of the Andean “superfood” quinoa and its close relative kañawa; processes of agricultural intensification employed by Formative period (1500 BCE-500CE) farmers on the Taraco Peninsula, Bolivia; and how modern-day indigenous Aymara farming communities understand and interact with their landscape in both productive and meaningful ways.